Dental cone beam computed tomography (CBCT) is a relatively recent 3D dental imaging technology. CBCT produces cross sectional images that are similar to the conventional CT imaging. However the main difference and the advantage of CBCT is the use of cone shaped radiation beam which enables significant radiation dose (10–50 times less) and scan time reduction. 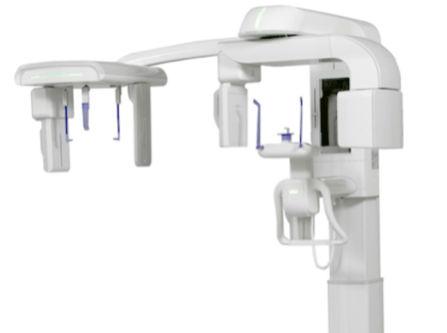 Dental CBCT is used for accurate and thorough treatment planning of orthodontics, impacted teeth and implant placement. It is useful to assess the dental structures, soft tissues, nerve paths and facial and jaw bones for more complex cases where regular dental or facial x-rays are not sufficient. There is no dietary restriction or other preparation requirement. Any items around the head, neck, and inside the mouth that may obscure the images will need to be removed including, jewellery, eyeglasses, hairclip, dentures and hearing aid. For some implant cases, you should bring a plastic mouthpiece (surgical guide) provided by your dentist which you will wear during the scan. You will be asked to stand in the machine with your chin resting on the chin support. The head will be fixed in a position by side supports and hands hold onto the handles. It is important to stay very still while the machine is scanning, rotating around the head for about 15 seconds. If surgical guide was worn during the scan, it must be returned to your dentist as it will be used again for your implant surgery. The images and report are normally ready on the following day. Hard copies of cross sectional 2D images can be provided on paper or film format within 1-2 hrs for urgent cases. Soft copy of 3D data can be also provided on CD to be used on surgery planning software by the referring dentist. Electronic transfer can be done for the referring doctor with online health system link. We provide specialised dental imaging services with cone beam CT that gives low radiation dose comprehensive 3D information of oral and maxillofacial structures that cannot be seen with a traditional OPG image. CBCT reveals high resolution and diagnostically critical information for general check-up, orthodontic treatment and pre/post surgical evaluation of implant, wisdom teeth, root canal therapy or maxillofacial conditions. Ability to generate multiple 3D image projection at various angles with inherent image transparency works for better evaluation and clinical outcomes.